One clear November morning in 2015, Arizona Department of Game and Fish biologist Ross Timmons struggled to match the morphology of a fish that he’d caught in the shin-deep Santa Cruz River with that of the western mosquitofish, an exotic species that flourishes in Arizona’s waterways. “All of a sudden I realized: My God, we’ve got a Gila topminnow,” Timmons said. He’d caught a federally endangered fish, an exciting — and long awaited — find. Six years after the renovation of the Nogales International Wastewater Treatment Plant, Gila topminnow swim in the upper Santa Cruz River again. In 2009 the plant completed renovations financed by the Environmental Protection Agency, and in 2015, Timmons and others found eight Gila topminnow. The following year, biologists found 135. Another native species, longfin dace, has reappeared in the cleaned-up upper Santa Cruz, along with western mosquitofish. From its headwaters in the grasslands of Arizona’s San Rafael Valley, the 184-mile Santa Cruz loops into Mexico, then crosses back into the United States just east of Ambos Nogales (Nogales, Arizona, and Nogales, Sonora), where it is mostly dry. More than a century of groundwater pumping for irrigation and homes has converted a network of lagoons, marshes and ciénegas into a largely waterless channel that fills only during rainstorms. In 1972, the Nogales International Wastewater Treatment Plant began releasing treated effluent into the river channel, creating 19 miles of perennial river flanked by riparian forest. But the facility struggled to keep up with increasing amounts of wastewater. While cottonwoods, willows and mesquite flourished on the river’s banks, fish, invertebrates and amphibians dwindled in the toxic effluent. Fish downstream from the plant suffered from unexplained skin and skeletal abnormalities. In 2001, the Grand Canyon Chapter of the Sierra Club sued the EPA for failing to take action against the plant, which by then served nearly 200,000 residents but was operating under an expired permit that it had violated 128 times in five years. The 9th Circuit of Appeals ruled against the Sierra Club, finding that the EPA could decide which cases it wanted to prosecute or prioritize. In 2005, an 8-mile stretch of plants shading the upper Santa Cruz River died. Alarmed, volunteers from Friends of the Santa Cruz River and researchers from the University of Arizona investigated. The cause for the plants’ distress? In a word, schmutzdecke. German for “dirt layer,” schmutzdecke describes a film of bacteria and other microscopic life that forms in nitrogen-rich water. Schmutzdecke in the Santa Cruz prevented water from percolating down into the soil, and plants right next to the channel were dying of dehydration. But since the treatment plant’s renovation, phosphorous, nitrogen and cadmium levels have decreased. Dissolved oxygen levels have increased. Groundwater infiltration has improved. And fish are surviving in the upper Santa Cruz again. 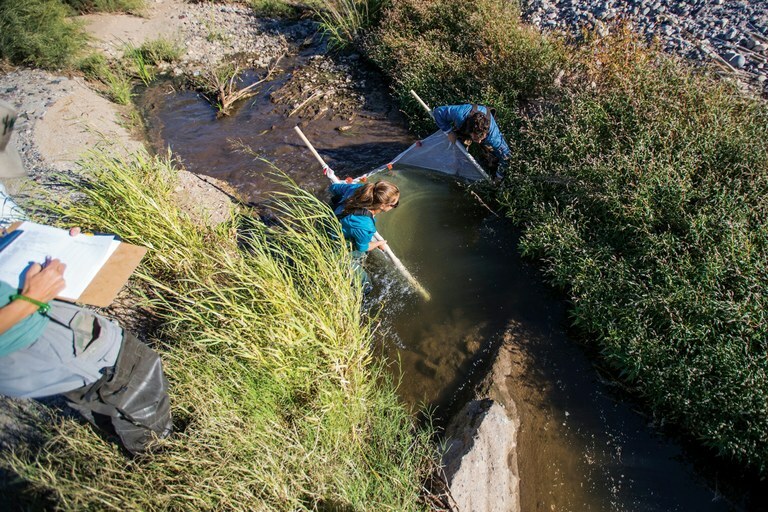 Biologists and researchers conduct an annual fish survey in the Lower Santa Cruz River to determine which species of fish are living in the river. Gila topminnow, 2-inch-long silvery fish, once swam creeks throughout the low deserts of Arizona, New Mexico, and Northern Mexico. When they were listed as endangered in 1967, topminnow had been decimated by groundwater depletion and by the introduced western mosquitofish, which eat topminnow and compete with them for resources. Native fish may be better adapted to handle those big flow pulses. 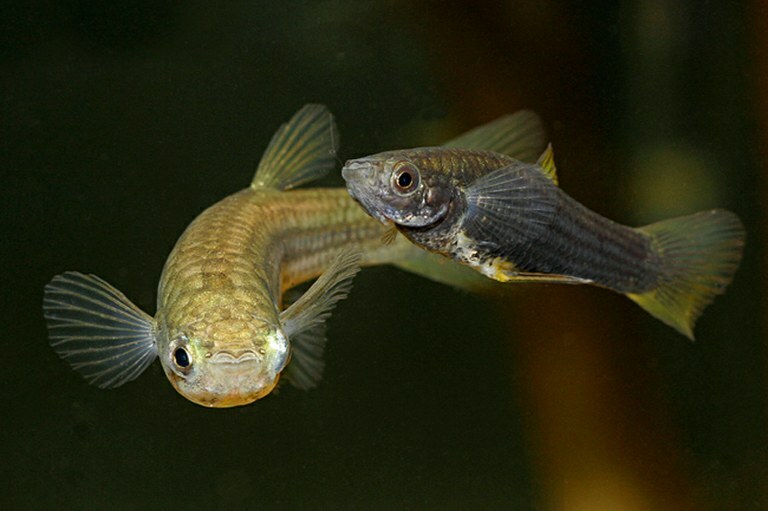 In laboratory studies, topminnow moved to the side of structures and turned to face artificial floods, while mosquitofish, which evolved in less episodic streams, tried to stay mid-flow and were washed downstream. Though not wild, the upper Santa Cruz is key to Arizona’s wildlife, many of which use riparian areas at least part of their lives. Rural communities also depend on well water from the Santa Cruz. As climate change creates a hotter, drier Southwest, prioritizing uses for clean effluent could become one of Arizona’s growing challenges. Maya L. Kapoor is an associate editor with High County News.